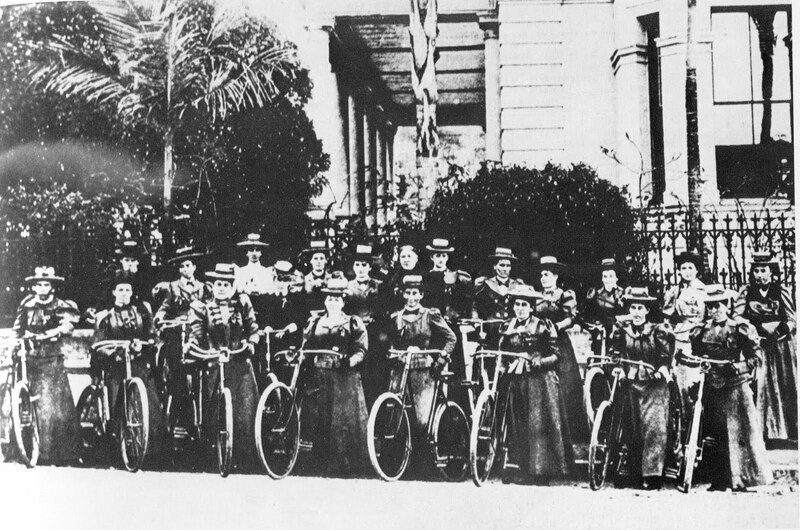 Just to prove that there's nothing new under the sun, here's a photograph of the Brisbane Ladies Bicycle Club in 1897, ready to set off on a trip from the Queensland Club. Despite my recent misadventures with cycling and the fact that I have had to give up on riding around Brisbane because I am experiencing episodes of vertigo, I quite like the pastime/sport. And I believe it to be good for general health and well-being. That's also the line being taken by Brisbane's lord mayor, Campbell Newman, as the city is about to embark on his CityCycle scheme. To counter Australia's burgeoning obesity rate, while also striking a blow against global warming, the city council is introducing about 150 bike stations all over Brisbane. These will be stocked with bicycles for hire - the idea being that you pay a nominal fee to pick up a bike from one location and ride it to another where you dock it back in. It is supposed to save on short car trips, reducing the number of vehicles on our roads. Will they be kept a bit tidier than this one outside my building? It is sitting under a row of Moreton Bay fig trees, and the dead leaves are the least of the problems here. 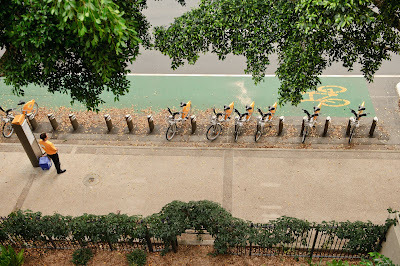 In summer, these trees fill with flying foxes, and the bikes that are parked here overnight will be covered in flying fox faeces every morning! Can't see too many commuters using those bikes. I hope it works. But I have my doubts that it will. So does the Courier-Mail, and so do many of us, apparently. Melbourne has recently introduced a similar scheme, and so far it can only be described as a dismal failure. That city's Bike Share plan had only managed a paltry 70 rides a day after its first couple of months of operation. Why? The locals reckon it is because of having to bring your own helmet - see this story from the Herald Sun. However, this scheme is much smaller in scope than the one here, and the promoters say that the higher number of stations in Brisbane will make a difference. But I'm willing to bet that we'll have the same problem here with helmets. Our road rules stipulate that a helmet must be worn whilst riding a bike on our roads, but hiring a helmet is problematic - would you wear someone else's sweaty helmet? Particularly here in hilly, humid Brisbane? And lugging a helmet around while shopping or going to a meeting doesn't seem too attractive either. Even the much-vaunted Paris bike scheme ran into problems. After eighteen months of operation, the contractor said it was going broke and could not afford to continue. It seems that half the bicycles provided for the Paris scheme were vandalised or stolen, according to a BBC report. The Parisian bicyclettes have been turning up all over the world, apparently. I even heard of one being found in Sydney. The contractor for the Paris scheme, JCDecaux, will also be the operator here in Brisbane. One of the other bugbears is what the plan is doing to the city's road users. Parking spots have disappeared in the city and suburbs. In my neighbourhood, residents and businesses alike have been critical of the reduced car spaces in an area of high-density living and commercial activity. My own street has residential apartment blocks, restaurants and cafes, a gym, as well as other small retail businesses - all of those depend on people being able to have access to them. My street is only 420 metres long, and yet the city council is installing three bike stations in that small distance. What - we want people to get fitter by riding bikes, but we can't let them walk more than 200 metres to get to the bike station? A bit silly, don't you think? And that has come at the cost of a dozen or so car spaces in a street that has no off-street parking for the public. Four or five car parks have disappeared from outside my building alone. My wife's parents, who are in their late eighties and do not live near public transport, could be faced with a walk of over a kilometre when they come to visit, depending on where they can find a car park. So, to reiterate - I hope it works. I hope Bribaneites are as keen as mustard about the scheme; I hope it single-handedly solves the obesity crisis; I hope it reduces our carbon footprint to the size of a pre-schooler's sandal. Because if it turns out to be a turkey, the ratepayers of Brisbane might be a trifle unhappy. Great picture of a station installed! I think its great for Brisbane, residents and tourists alike. I hope people use the bikes Luke! The scheme would probably appeal to tourists, but for it to be a success, residents need to use the bikes too. I hope it works, because it has the makings of a good idea ... I'm not sure it's been thoroughly thought through though (that's a lot of 'ough' words in one sentence!). Have you seen the new low billboards scattered around the city suburbs?They're a bit of an eyesore but are pretty much financing the scheme, which means the bikes remain... and prove to be a success I hope. Think I'll need to start carrying my helmut around with me! Well, JCDecaux aren't footing the bill entirely. The cost to Brisbane ratepayers is about $8 million over the next four years.